LeBron James surpasses Michael Jordan as NBA playoffs leading scorer – Royal Times of Nigeria. 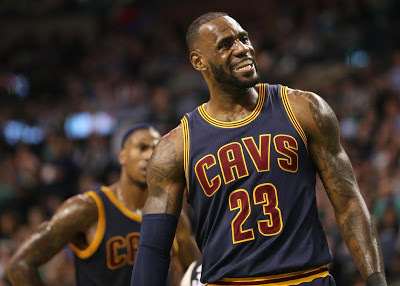 Cleveland Cavaliers star, LeBron James, has surpassed Hall of Famer Michael Jordan as the leading scorer in NBA playoff history after helping his team to comfortably beat the Celtics 135-102 to clinch the best-of-seven series 4-1 on Thursday, setting up a third successive championship series against the Golden State Warriors. James who needed 28 points to surpass Jordan (5,987 points) which had stood for 19 years, achieved the milestone in the third quarter with a three-point jump shot, which put the Cavaliers up by 32 points setting his new mark at of 5.995 points in 212 play-off games, while six-time NBA champion Jordan set his record in 179 games. Speaking to reporters after the game, the 32-year-old said: “I think, first of all, I wear the number (23) because of Mike,” he told reporters after finishing the game with 35 points to take his total to 5,995 points. “The biggest thing for me sitting here after breaking the all-time scoring record in playoff history, is I did it just being me. “I don’t have to score to make an impact on a game and that was my mindset when I started playing, if I’m not scoring how can I still make an impact on the game? LeBron James, who no doubt is one of best Basketballer in the World has won three NBA championships, four NBA Most Valuable Player Awards, three NBA Finals MVP Awards, two Olympic gold medals, an NBA scoring title among many others.